The world’s most precise volumetric calibration rig for flowmeters up to DN 3000/120"
Vary different parameters such as temperatures, viscosities, pressures etc. For calibration we only use direct comparison of measurands (e.g. we calibrate our Coriolis mass flowmeters with a gravimetric weighing system). Our calibration rigs are the most accurate used in measuring device production worldwide: the accuracy of the reference is usually 5 to10 times better than that of the meter under test. 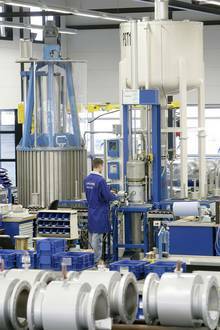 This goes for small as well as for very large sizes: KROHNE operates the world’s most precise volumetric calibration rig for flowmeters up to DN 3000 (120"*) with a certified accuracy of 0.013 %. The reference vessel is a 44 m (144 ft*) high tank containing almost ½ million litres (132,000 gal*) of water which allows for a maximum flow rate of 30,000 m³/h (7,925,000 gal/h*). Our meters can be calibrated and certified according to various standards such as OIML, API, Measurement Instruments Directive (MI 001, 002, 004, 005), GOST, etc. All our calibration facilities comply to the traceability requirements according the ISO 17025. Regular inspections by national metrology institutes, round robin tests and alignments with national and international metrological standards according to ISO 9000 and EN 45000 guarantee the quality and comparability of our calibration rigs. Staff performing the calibrations are trained and given regular re-trainings to ensure quality and continuity.